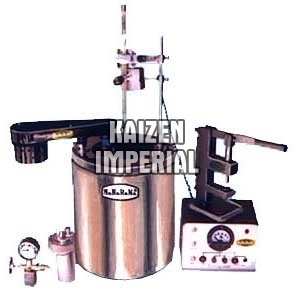 The Bomb Calorimeter we manufacture is supplied with bomb calorimeter vessel containing bomb support, water jacket, combined lid for calorimeter vessel and water jacket, stirrer, commenting leads, connecting tube to connect to pressure gauge. The Calorimeter also has a valve for bomb and valve key and is supplied without oxygen cylinder. Bomb Calorimeter is tested as per the recruitment of Institute of Petroleum (IP 12/63T). The bomb has a capacity of 300 ml approximately and provided with a high pressure schroder valve.